Bugster2 wrote: I can't stand wooden spoons either, Jimmy. I don't like the way they feel. They make my skin crawl. 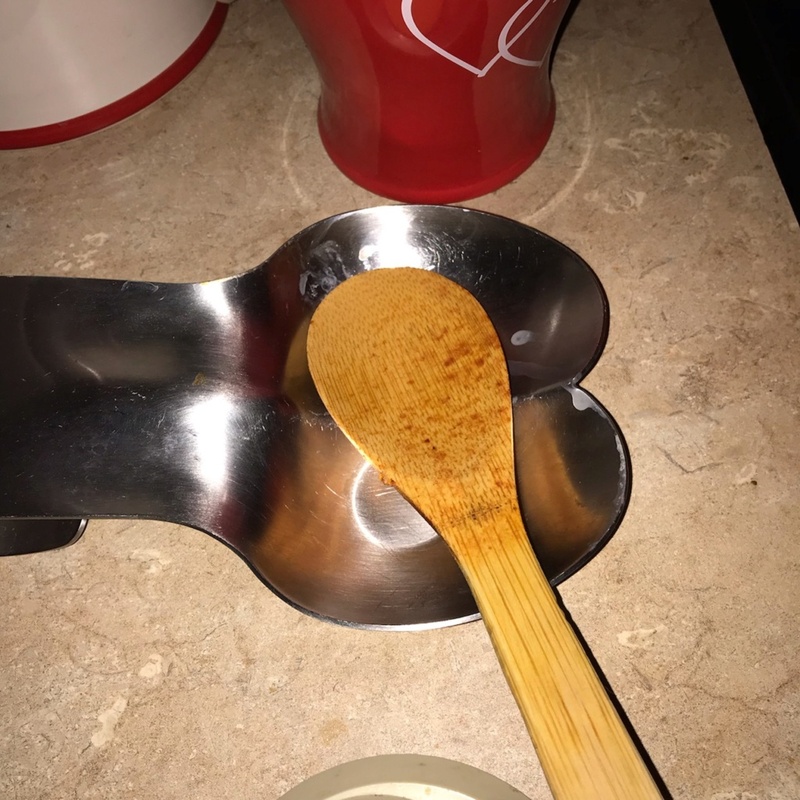 This spoon I was talking about had a notch taken out of the handle so it could rest on the edge of the pot and drip into the pot. I was looking at the measuements and it might be too big. 14 inches long. Great for big pots but I don't know about other, smaller pots. Just cleaned up the cat's barf. I have to do it almost daily. With 4 cats it is a given. I do the same sequence to clean up the yack! Only, I add step 12. & 13. 12. Sprinkle the area with baking soda. Then place a paper towel on to to mark the spot; so we see it not to step on it. Beth wrote: We'll be gone all day tomorrow. Cheryle's oldest son, Danny, lost his oldest daughter a couple weeks ago, well, a couple months ago. She had been missing for a couple months and they found her remains. It's been awful for him, our hearts are breaking for all he's going through. She was only 23 years old and a single mom of 3 although the children live, I believe, with their fathers. There is no explanation yet and the case is still an open investigation. So we'll be going to attend a memorial / celebration of life for her and to give whatever support we can to Danny and his son who flew in from California where he's stationed (he's in the Marines). How tragic and sad, Beth. So Danny is Dane's nephew, right? And the deceased his great niece? So very sad when a person so young passes away, all the more so in tragic fashion. Was she involved in something untoward that they know of? Will say a prayer for her and Dane's sister, too. UNCLE JIMMY wrote: The army corps of sandcastle builders Tina said. Tell Tina I loved that!! UNCLE JIMMY wrote: When she was little, the corps of engineers assured that the levies to stop flooding near the low valley and the flats, were going to stop floods no matter how much it rained. They never took into consideration the Damn breaking in their calculations, and she was one of the little girls taken off the 2nd floor rooftop in a row boat. Where was Tina living at the time, Jimmy? Tell her I'm so sorry for the losses her family and her hometown suffered -- that's something one never forgets. UNCLE JIMMY wrote: Supper was a burger with onion and cheese with ketchup. Maria made an apple pie, and I'm waiting for it to cool. Jimmy, you really deserves kudos for how well you're doing since you got out of the hospital. Your family, too, has worked very hard to make it easier for you to eat healthy foods. You all deserve a hand. Brian has to watch what he eats today as well. He has a PET scan scheduled for tomorrow and they want him to eat little to no carbs today. I had to google low carb meals. I'm going to make some wrapped ham and cheese rolls with mustard for his lunch. And he's looking forward to a bacon, cheese and onion omelet for dinner -- with more bacon on the side, I'm sure. CT scans showed a couple weeks ago that Brian has a small growth in his left lung. They're pretty sure it's cancer but we're all hoping, doctors included, that it's prostate cancer metasisized to his lung and not lung cancer. If ANY of you are praying people, I sure would appreciate your prayers as I've been a nervous wreck ever since, though I'm keeping my worries to myself (not easy). Seems funny to ask for friends to pray it's prostate cancer but I'm praying it is. It would be lovely if it was something else -- he recently was told he's got mild emphysema -- but I doubt his esteemed prostate cancer oncologist would say he was pretty sure it was indeed cancer if it wasn't so indicative of it. It was pretty small at the time of the scan so we're not sure what treatment would be recommended if it is indeed lung cancer though I heard one of the team of doctors in the room say they might be able to remove part of his lung if necessary. One good thing about it being prostate cancer is its growth is indicated by his PSA. I asked the doctor if a recent rise in his PSA wasn't a good sign about the lung but he said in Brian's stage of prostate cancer, that small an increase in his PSA is pretty normal considering his current treatment. The scan is tomorrow and we meet with his doctor on Thursday. We've been blessed so far over the last 19 years of his initial prostate cancer diagnosis so I only hope God sees it to help us out just one more time. Niagara Visitor wrote: I have seen powdered mixes for dressings, have never bought any. I've never purchased gravy or Ranch packets but years ago, I used to make a vinaigrette and stir a smidge of the Good Seasons packet in it. I'm smiling because I haven't thought of those days in YEARS. Somehow we ended up with several of those Good Seasons packets and that's how I used them up, little by little. We're laughing as Brian doesn't remember how we got them and I don't either. Maybe someone making a salad when we had a large group of people over brought them. I have no clue! But when I ordered from Walmart the other day, I bought a packet of Ranch Dressing mix but I got it to use in a loaf of bread I'm going to make! Have had the recipe for years but never remember to get a packet of Ranch as we usually don't go down that aisle in the grocery. When I was looking over the items Walmart has on their list for online purchase, there was a packet of Ranch dressing calling my name. Will let you know how the bread with the Ranch dressing turns out. I'm also going to make a loaf of Orange Cranberry bread in the bread machine. It's soooo good and makes the best toast. Made with about 1/4 cup of orange marmalade and about the same amount of dried cranberries -- just a wonderful loaf of bread with really nice crumb, too. Makes a great loaf to give away, too. You and Brian are always in my prayers, Michelle ~ but I'll add a request for a special watch on that spot. Tonight we had what I'm not referring to as 'Michelle's Special' ~ Leftovers. You all know how much I (don't) love leftovers. But I couldn't come up with any good ideas and Dane suggested we clean out the refrigerator before the leftovers had to be tossed. I heated up leftover Chicken Enchiladas for him and I had the leftover Beef Short Rib & Noodles. It was OK, but not anything I want to repeat any time soon. Bugster2 wrote: Not having to sear the meat is wonderful. Searing makes a heck of a mess and I have to wash eeverything, including the stovetop grates. Next time I will give it a try. It may be messy but there's no getting around a good sear on beef -- there's absolutely nothing that makes up for the flavor it adds to a dish. If you really hate cleaning up the splatter, you can cover the other stove burners and the back of your stove with sheets of heavy duty aluminum foil. That's what a friend's elderly mother has done for years. She picks up the foil afterward, too, and places the greasy sides together, folds it up and sticks it in a plastic bag. My friend said she gets a couple of uses out of the foil prior to pitching it, too. I don't know about saving the foil but it's not a bad idea if you just cleaned the stove or you just don't feel like cleaning it over again. I guess you could use the regular aluminum foil instead of the heavy duty stuff instead. I'd imagine it looks like hell while you're doing it (I keep thinking of the Beverly Hillbillies ) but it must be kind of satisfying when you pick it up afterward and see your spotless stove underneath! Brian and I invariably cook something that needs searing the day or day after Lynn, the lady who cleans for us, comes -- we laugh at ourselves all the time. But we DO try to remember the night before she comes to clean, "What can we cook that's kind of messy NOW instead of tomorrow night?!" Lynn came today to clean so our house is absolutely spotless and even SMELLS clean. We're truly lucky to have her as you can tell she's concerned about us and always says prior to leaving, "If you two need anything at all or if I can help you with something, you call me, okay?" She was smiling today as I gave her a generous raise. She deserves it as she does a lot for us and now does stuff that she marks down on her phone's calendar that will need doing again in three months, six months, etc. Recently while cleaning out our really small, cramped laundry room, she insisted on pulling the dryer out to make sure the venting tube wasn't clogged up with lint but what she found was even worse. A cotton throw had fallen behind the dryer on top of the vent tubing (I plead innocent!). She removed the tubing which was full of water (!!) due to the pressure of the throw on top of it (and was taking FOREVER to dry things if it dried the bigger items at all), and got everything back in order. The dryer is drying in record time again and Brian is a happy camper (he does the laundry). We always pay her extra, of course, when she does things above and beyond regular house cleaning and she says we're way too generous but we're very lucky to have someone who really gives a darn about us like she does. Lynn also does landscaping work, too (she's a Master Gardener!) and will repot plants, weed the garden, amend the dirt in spring or fall with fresh soil, compost, peat moss and/or manure and will even go to Home Depot and pick up all the stuff she needs to do what I want done. We can't lug any of that stuff anymore, nor can we tend to the garden like we used to. It's so nice to have someone who will do just about anything for us that needs doing (and will just go ahead and do those things). We're smart enough to pay her well and give her a generous Christmas bonus, too, so I think she appreciates us as much as we appreciate her. She's also handy as all get out, too, and has put together items I've purchased that need assembly and fixed things that have broken or stopped working. There's literally nothing she can't do but she told me she learned how to do tons of stuff by watching videos on You Tube! She raised 4 boys on her own (Lynn is in her late 50s & her youngest graduated from high school 2 years ago while her eldest is 38) so she said she HAD to learn to do things on her own. Niagara Visitor wrote: My late daughter's best friend was in Toronto on business for a few days, so my son Danny, daughter-in-law Amy (other son's wife) and I met Jenelle in a restaurant halfway between Toronto and St. Catharines for lunch. I am so happy that Jenelle comes, this is her third trip since Cindy died, so it is always lovely to see her. She is studying to become a certified instructor for 5 Rhythms dance, and apparently it is very popular in Toronto. I really must go visit her in Anaheim too! Wow, Lore, what a darling woman Jenelle must be! That says so much about not only Cindy but you and your family, too. In this sometimes heartless world, hearing about Jenelle's visits really warmed my heart. She must've loved Cindy with all her heart. 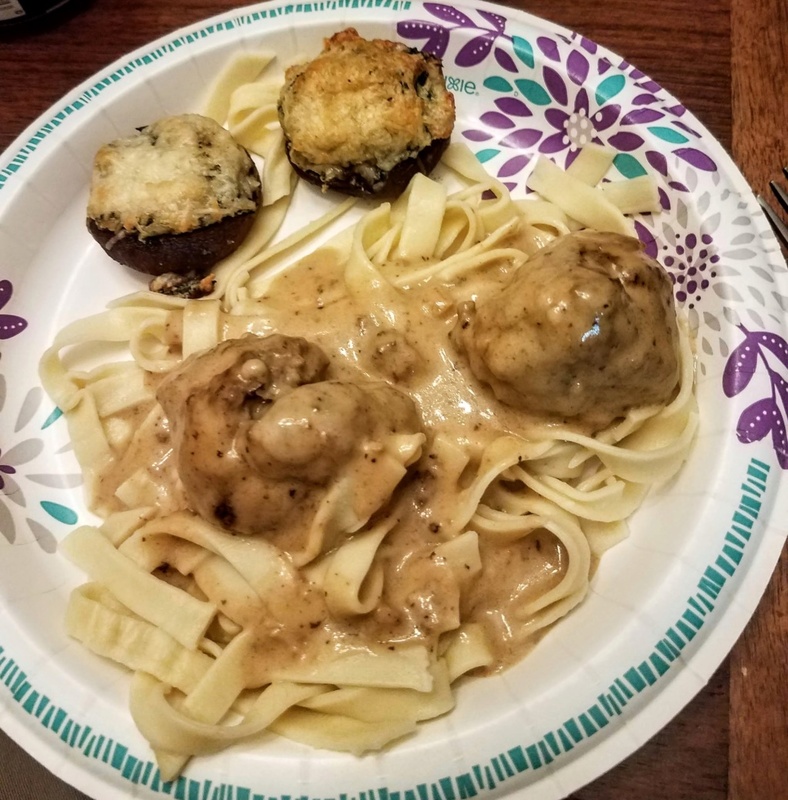 Dinner tonight was home made egg noodles, Swedish meatballs and stuffed mushrooms. inner tonight was home made egg noodles, Swedish meatballs and stuffed mushrooms. Bugster2 wrote: There was nothing on TV so in desperation I turned on Rachael Ray. While she was cooking I noticed she had a spoon with a cut-out so you could rest the spoon on the rim of the pot. Anyone own one? What do you think? It is called a lazy spoon. I think they're pretty nifty, Debbie. 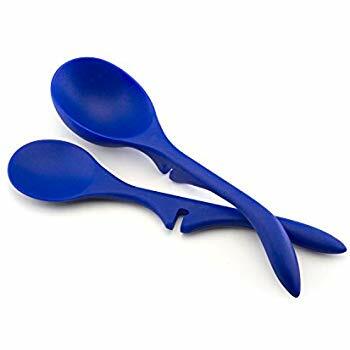 I checked them out on Amazon and saw that they're heat safe to 500°F so that means they won't melt like some of the silicone spoons they sell today. And they pass one of my "by-laws" by being dishwasher safe, too. So many pans today need tools that won't scratch them, another plus. One reviewer said she uses them with her Le Creuset pots so that tells me the notch is big enough to fit on just about any pot. I'm thinking these would come in handy instead of having a spoon or two on a saucer next to the stove, which I always seem to knock off the saucer time after time. They have really good reviews too. I don't think I can fit one more thing in either of the kitchen drawers I have for tools and gizmos like this. In fact, both of my drawers need a good culling and cleaning! 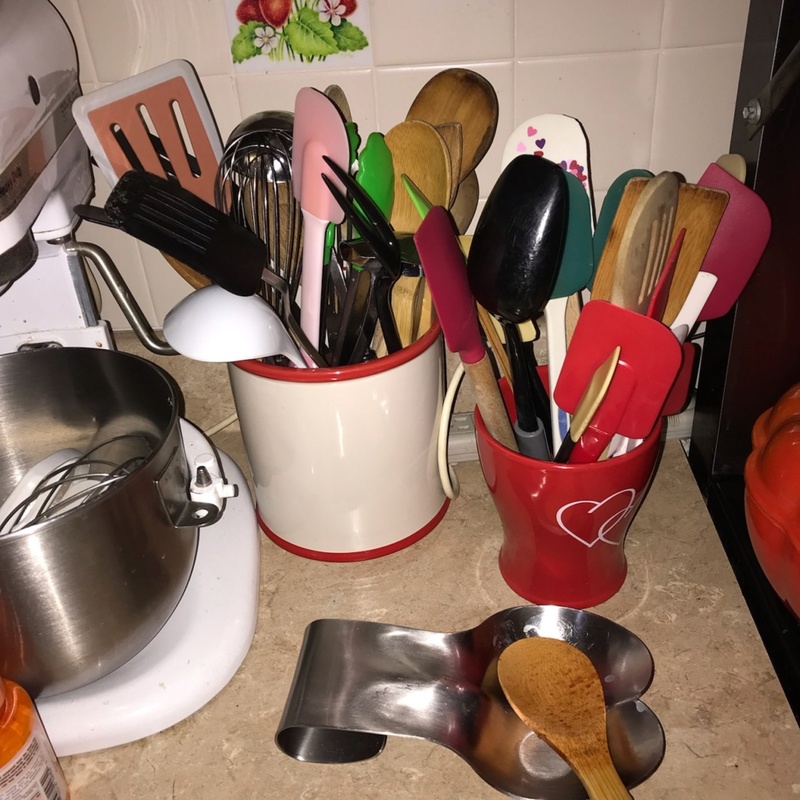 But they'd make a nice gift for a foodie friend and they come in lots of bright colors, which makes them easy to locate if one has overstuffed kitchen drawers like mine. Brian really liked them -- he's a lot like my father who loved gadgets. Thanks for sharing those with us. Add to that mess are appliances that I really don't use. Bugster2 wrote: Just cleaned up the cat's barf. I have to do it almost daily. With 4 cats it is a given. Had cats all my life, Debbie, but never had a problem. If it's not due to hairballs, why are they spitting up? Check with your vet. If I noticed one of ours had a hairball, I'd just give them a couple of those hairball "treats" that come in little foil ziplock packs -- they worked like a charm and the cats REALLY liked them, too. I'd check with the vet if they're barfing all the time. If it's just due to Persians grooming themselves, you could give each of them a few hairball treats every day. They really worked for us when I noticed one. That's really a shame they do it on carpet, too. We're lucky as we only have carpet upstairs -- wood floors and now porcelain tile in the kitchen. I got one of those Bissell Crosswise machines about a year ago and they're great on floors or carpets to clean up spills. I see them advertise ones similar to mine but specifically for people with pets, too. You might want to look into one the next time you're in the market for stuff like that. You could just use a paper towel to pick up the hairball and then use the machine to clean off the carpet. Last Thanksgiving my brother-in-law dropped an unopened 1.5 liter bottle of wine he was taking out of the fridge on our new porcelain floor. The guys quickly picked up the larger pieces of glass and I whipped out the Crosswise I'd only used once before on when I got it. While doing my best Vanna White impression, complete with sales commentary, everyone was amazed at what quick work it made of cleaning up everything, including the glass pieces. (They were all amazed at how calm I was but hell, what could I do, as he didn't do it on purpose and I knew how bad he must've felt. And it helped that the new machine made such quick work of the cleanup, too!) I think I "sold" two of them that day! After it vacuumed up the mess, I just pressed the spray button to clean the wine off the floor and in less than 5 minutes that machine had cleaned up the mess and was put away. Sold everyone on it, including me! Brian cracked everyone up later on when he asked Ed, "Where're you going next Thanksgiving, Ed?" Funny because about three weeks ago Brian was sitting on his friend's porch having a beer and watching the world go by and he saw my BIL (he owns the house our friend Pete lives in and he lives next door to Pete). Brian kept bugging me to call him and ask him to come for T-Day and so he said, "Hey, Ed. What're your plans for Thanksgiving?" They all laughed as Ed immediately said, "I'm having dinner at your house, Brian." A moment later he added, "And this year I'm not going to drop an entire bottle of wine on your floor either!" Persians groom themselves and eat so much hair. That is the issue. I don't believe I have seen hairball treats before. I will check them out. Thanks for the tip. I also had to clean up dog pee. One of Katie's dogs nailed my carpet. Out came the paper towels and the "Stink Free". Leftover chuck roast for Joe. I don't really feel like eating. Katie had chips and salsa. bethk wrote: You and Brian are always in my prayers, Michelle ~ but I'll add a request for a special watch on that spot. Seriously, though, thanks for the prayers, B. He got a call from the PET scan place about 3:30 p.m. that they had to reschedule the damn thing due to his insurer not okaying it quickly enough. Boy, that ticked me off but Brian was very nice on the phone to the lady, who seemed shocked at his kind demeanor. Now he has to reschedule Thusday's appt. with the pulmonologist (I thought it was with his oncologist) and the appt. a week after THAT with the oncologist. Personally, I think the PET scan people didn't hop on it soon enough to contact the insurer as the appt. was made over two weeks ago. She called Brian early last week to "make" the appointment that was already made (date and time) by the oncologist's staff while we were still there discussing it. She said he should've called to confirm it even though the doctor's office had made it. So she had it confirmed at the beginning of last week and now even though they HAVE the insurer's okay, they said it didn't come soon enough (so obviously they'd given away the timeslot already). Ticks me off because those of you who've experienced serious illness know it's the WAITING that makes everything even worse! The good part is that it was cold and rainy today with windchill in the 20s (our coldest day yet by far and nasty as all get out). More of the same tomorrow but with less wind. My Yankee boy sure hates the cold so he said he'd feel good about it tomorrow morning when he was snuggling under his oversized king down comforter having a cop of coffee his lovely wife delivered to him in bed! I couldn't help laughing. Told him his lovely wife hopes the new OVERSIZED comforter means she'll have some covering her side of the bed for a change! I know he was trying to make me laugh as he knows I almost breathed fire when the PET scan people phoned -- another two weeks until we see his oncologist now -- and we just waited two weeks! NormM wrote: Dinner tonight was home made egg noodles, Swedish meatballs and stuffed mushrooms. Those noodles are so neatly cut I'd have never dreamed they were homemade. Looks like you used a ruler, Norm! Bugster2 wrote: Persians groom themselves and eat so much hair. That is the issue. I don't believe I have seen hairball treats before. I will check them out. Thanks for the tip. They're highly rated on Amazon, too. Only sold by the dozen bags on there but it sounds like you need 'em. Deb. 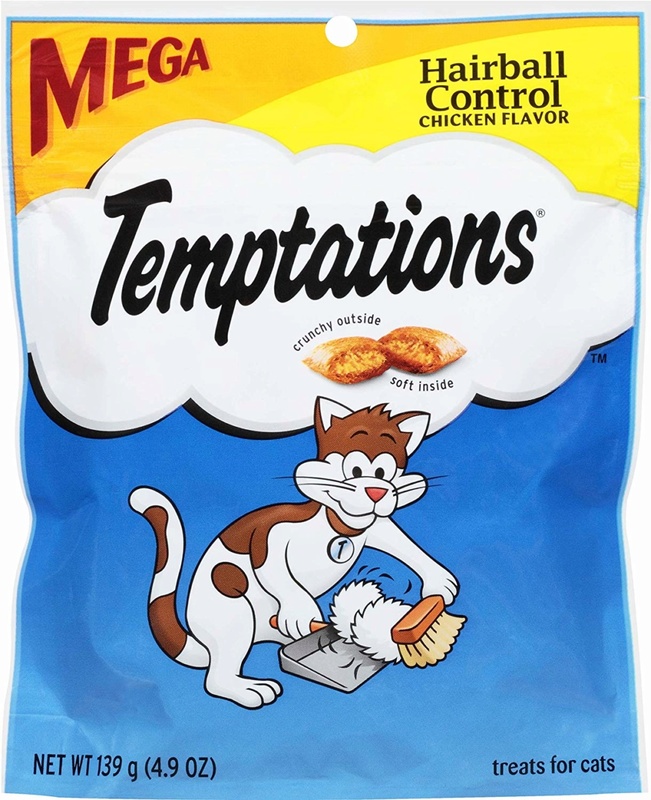 The good thing is our cats liked them like they were just regular treats. Gobbled them up. Thank you for the picture. Now I can find it easily. Bugster2 wrote: Thank you for the picture. Now I can find it easily. They work deb. I order them on Chewy. They are cheaper than at the stores. Spaghetti and turkey Balls..... Bread slice, with spread. Dessert.... Jello with cool whip. All right.... supper is over, DD cooked at 9:00 after her work period. Plus Tina made the spaghetti for son Jim, and his MIL who stopped over after work. So we ate at 6. I'm NOT waiting to eat at 9. No No! All the pots and plates were all wiped and cleaned up. YET..... ( and god only knows why ) the spoon rest and a dirty spoon at the bottom of the picture, was never picked up and cleaned..... How can this be? I give up! Yet, God forbid I should leave my coffee cup next to the coffee maker without rinsing the cup out, would be a disaster, and I would never hear the end of it. Check out the implements! .....and there is a drawer with just as much tools. UNCLE JIMMY wrote: All right.... supper is over, DD cooked at 9:00 after her work period. WOW! That is a lot of implements there! Love the red container, it would fit right into my kitchen. I have the same KA mixer. It was my daughter's. Lore. the red jar is from a gift of fruit I sent Tina from Edible Arrangements. As soon as Tina saw it, she marked it to use for the overflow of implements from the existing jar. Supper was a beef chuck stew that Tina made. It was great. DD and Boyfriend even ate some. They finished it up. No leftovers....WOW! They cook their own types of food, but nothing I will eat. i.e. fried chicken and kale wraps, on flat breads. I Had two low carb biscotti for dessert with a coffee! 151 Re: Welcome November what's cooking!